Labour leader Jeremy Corbyn said he is determined to make youth provision a statutory duty for local authorities as he tried his hand at archery at an activity centre for teenagers. 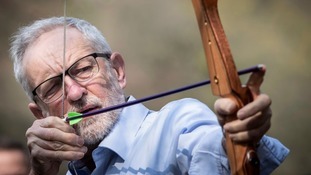 Mr Corbyn showed a marked improvement as he was shown how to use a bow at the Sunnyvale Fishery and Outdoor Activity Centre in Hipperholme, near Halifax, West Yorkshire, on Monday. After half-a-dozen wayward efforts, the Leader of the Opposition managed a shot in the black ring and then quit while he was ahead after landing a shot in the red. He then moved on to the watersports area and talked to youngsters after donning a lifejacket and a helmet to sit in a canoe. But he did not launch on to the lake. Mr Corbyn, who was visiting with shadow home secretary Diane Abbott and Halifax MP Holly Lynch, said he was impressed with the centre, which is open to children across the the district and aims to provide an alternative path for youngsters from a life of criminal offending. Mr Corbyn said: “This, of course, is in a background where there’s been a 70% cut in youth service provision in the past nine years – £800 million taken out of a youth services. “And, not very surprisingly, there’s been an increase in youth crime and youth violence. “So we do, as a country, have to invest in young people. That means youth services, that means youth workers.